Metabolic Code Enterprise joins forces with NutraLogics, Inc. to become a leading frontrunner in the field of integrative medicine through metabolic optimization. The Metabolic Code is a cloud-based, personalized health platform that collects large amounts of data through labs (blood biomarkers, urine, and saliva), lifestyle questionnaires, and biometrics (BMI, weight, heart rate, and blood pressure) to determine where the greatest metabolic roadblocks exist for the individual. It then examines their essential organ system networks and assesses patterns, or “metabolic clusters,” to target the most pertinent physiologic imbalances that need priority addressing. The Metabolic Code platform generates a consumer-friendly Health Assessment and Vitality report. This report details where the individual’s health is today, but more importantly, where their future health and vitality risk is at, should they continue with their current lifestyle choices. Personalized recommendations are then made based on lifestyle factors such as the strategic use of dietary supplements, nutrition, behavior and exercise to restore resiliency, quality of life and optimal metabolic function. The Metabolic Code platform enables healthcare providers to place orders, issue laboratory requisitions and receive results, deploy patient surveys, generate reports and supplement recommendations, and track all of the outcomes. The partnership with NutraLogics resolved the challenge of distributing and fulfilling professional based supplements throughout the United States. NutraLogics provided the answer through its ability to provide an end-to-end solution for supplement ordering, auto-ordering, and distribution. NutraLogics has partnerships with leading supplement manufacturers. “Jim LaValle, Andy Heyman, MD, and our team have cracked the Metabolic Code, but we needed NutraLogics to go after the market at large to maximize every person’s health and wellness potential,” says Bassel Haidar, CEO and President of MCE. James LaValle, Founder and Chairman, Metabolic Code Enterprises, Inc.
Bassel Haidar, CEO and President, Metabolic Code Enterprises, Inc.
Maxine Savage, President, NutraLogics, Inc. The Metabolic Code (MC) evaluates where a patient’s chemistry is today, and predicts their potential future health risks. Healthcare providers receive a MC Health Assessment and Vitality Report highlighting their patient’s previously uncovered metabolic imbalances and disruptors before they turn into chronic conditions and accelerate aging, and also provides a personalized plan to optimize the patient’s health and vitality. 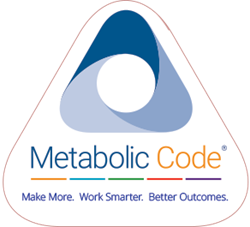 The Metabolic Code empowers healthcare providers to Make More, Work Smarter, and Deliver Better Health Outcomes. NutraLogics provides practices with a turnkey supplement fulfillment solution that is simple, yet comprehensive. With NutraLogics, physicians can seamlessly sell preferred supplement brands from the nation’s leading manufacturers to patients in their offices, online and through NutraLogics’ advanced Auto Order Fulfillment solution. NutraLogics’ comprehensive supplement fulfillment solution makes it easy and focuses on generating more revenue to the physician’s bottom line.